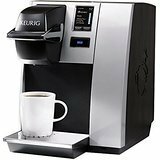 Keurig K150 Brewer Commercial Brewing System by Keurig at Jakis Cafe. MPN: K150. Hurry! Limited time offer. Offer valid only while supplies last. Keurig K150 Brewer (previously called B150). Choice of 5 cup sizes (4 oz., 6 oz., 8 oz., 10 oz. and 12 oz.) 90 oz. removable water reservoir.